As west side neighborhoods like Bucktown and Wicker Park significantly gained popularity and desirability over the past decade or so, it was only a matter of time before widespread development and a similar transformation spilled over into other nearby neighborhoods, which is exactly what has happened in Chicago’s Ukrainian Village community. Located almost immediately south of Wicker Park, Ukrainian Village’s overall look and feel is very similar to that of its neighborhoods to the north in just about every way, from its quiet tree-lined streets to what you’ll find in terms of amenities and attractions. From a real estate standpoint, Ukrainian Village is filled with all kinds of vintage brick condo and apartment buildings, plenty of old cottage or bungalow style homes that have since been updated or remodeled, and even a wide range of new construction single-family homes with a chic modern-contemporary design. Furthermore, the restaurant and bar scene all throughout the Ukrainian Village neighborhood is also thriving much like nearby Wicker Park and Bucktown, giving potential home buyers an added incentive to pull the trigger on an available listing here they may happen to like. Thinking of Selling Your Ukrainian Village Home or Condo? If you're looking to sell your Ukrainian Village home, condo, or loft in today's ultra-competitive market, contact Gold Coast Realty to learn more about how we can get your property sold fast, and for the price you need! Unlike Wicker Park or Bucktown, Ukrainian Village is a much smaller west side neighborhood in terms of area and is bounded by Division Street to the north, Chicago Avenue to the south, Damen Avenue to the east, and Western Avenue to the west. 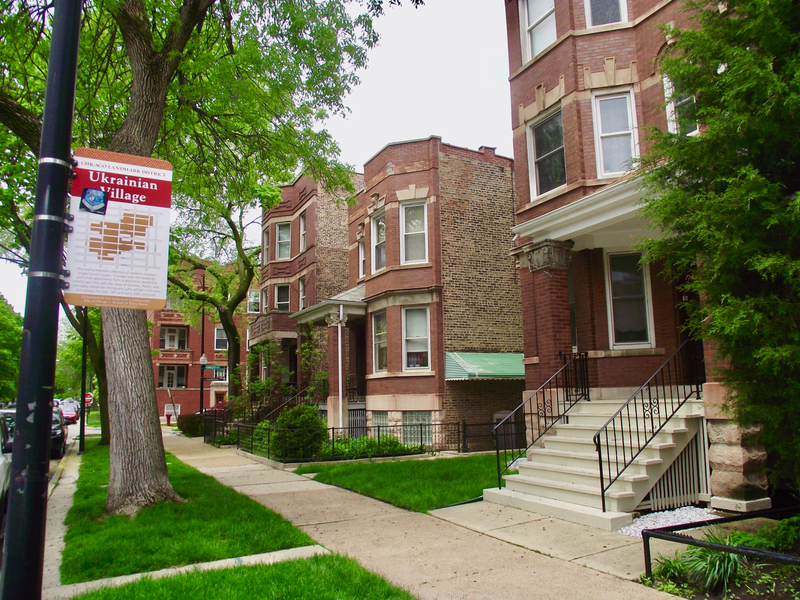 Despite it small size, however, real estate in Ukrainian Village offers a wealth of attractive options, and in late 2014 and the better part of 2015, it was actually one of the hottest locations in all of Chicago, with homes selling faster than any other neighborhood in town. The heart of Chicago’s West Town is also situated just blocks from Ukrainian Village, which is also another red hot location in terms of real estate. Home buyers are continuing to find all kinds of great deals on this side of the city, and people also really like the location in relation to downtown, which is perfect for anyone who works in The Loop or another part of the downtown area. So, with great restaurants, a vibrant nightlife scene, and all kinds of great housing options, is there any down side to living in Ukrainian Village? Well for those who rely heavily on public transportation, there isn’t a single CTA train station within the neighborhood, although several major bus lines can be caught along Damen, Chicago, Western, and Division, and the Division Street Blue Line is also not terribly far away from Ukrainian Village, especially for those who live on the northern side of the neighborhood.